Ganache Chocolate is one of those places that I've known for years, and just never wrote about on this blog because I kind of take it for granted. It is the place I go to when I need an awesome cake to bring to a party. My favourite is the Hazelnut Fan - layered with milk chocolate mousse, hazelnut sponge and hazelnut praline. If you like chocolate-hazelnut combos like Nutella or Ferrero Rocher, you'll love this cake. It is just utterly delicious with the smooth and crunchy layers, the nutty cocoa flavours. You can get single slices too, but a whole cake is better value, so when there are special occasions I leap at the opportunity to purchase one. I've gotten it from the original South Yarra store (250 Toorak Rd, South Yarra) and also the Melbourne CBD branch (245 Collins St, Melbourne) - both were of the same fabulous quality. 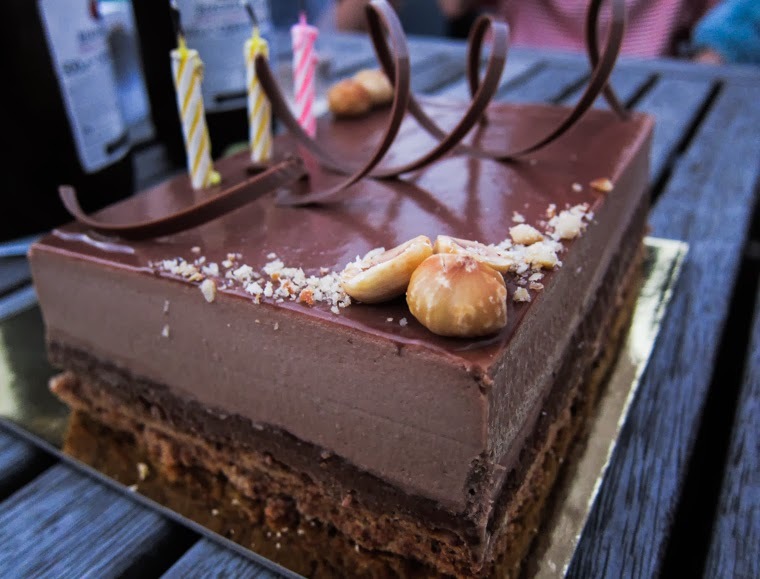 Hazelnut fan cake from Ganache Chocolate (starts from $33 for a small cake to feed several people). It is also the place I go to when my friends are in the neighbourhood and we're just looking for a place to chill out. 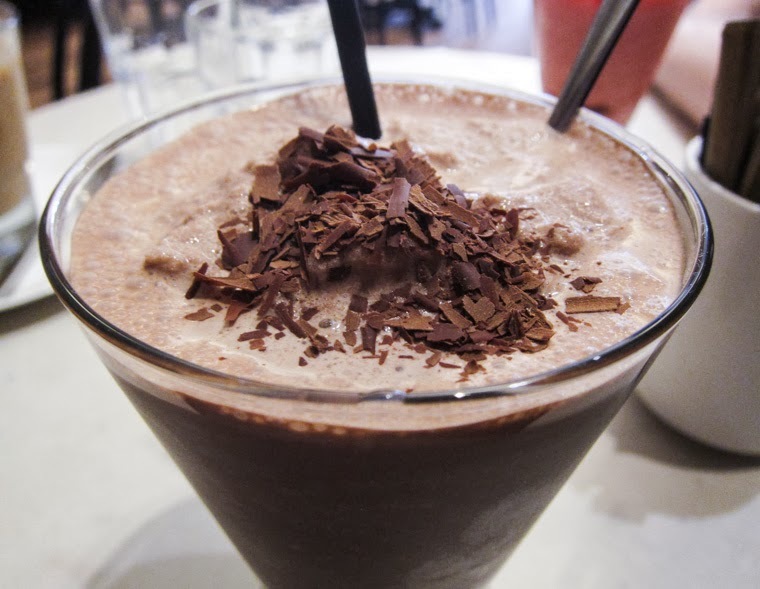 My most recent order was a Chocolate Frappe from their specialty summer drinks menu, a blended icy drink with gelato and ganache. It had the ideal balance for me - authentically chocolatey, without being too rich and heavy, and not too sweet. Just right. Ganache Chocolate also has a simple selection of savoury dishes on their menu, with items like croque monsieur, quiches, and sandwich bread rolls, which look attractive and reasonably priced. Due to the main attraction that is their chocolatey goods, I've never gotten around to trying those. But they're definitely on the radar, and I may have a light lunch there someday. Meanwhile, if you haven't been, and you happen to drop by, do try their chocolatey goods! That cake looks amazing. Add a bit of coffee into it somewhere and it'd be my idea of heaven. Mmmmm, mocha would be pretty nice, I agree! Yum, I love the look of that cake! It really is quite magnificent. Yum! I've been to Ganache a couple of times, but have only had hot chocolates and ice-cream, haven't tried their full cakes yet. Must go back soon! I'll admit I need to try more of their cakes. I keep going back to that choc-hazelnut one.